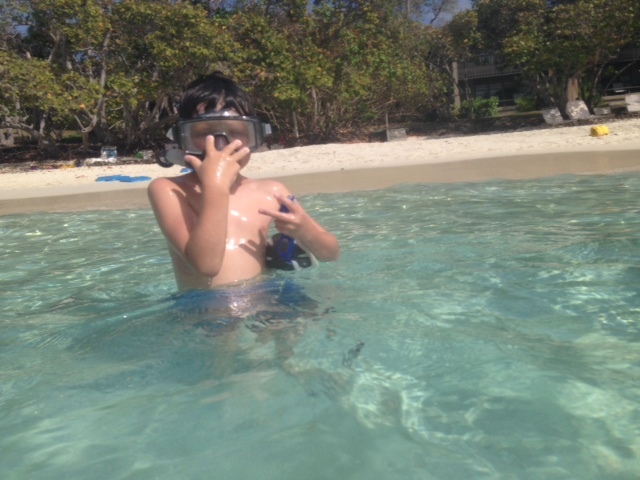 We had many things on our list to do with the kids in St. John and right at the top was snorkeling….even though the kids are a little young. We wanted to try it anyway and Caneel Bay Resort on St. John allows you to check out snorkeling equipment for the duration of your stay. We figured we might as well try snorkeling with kids. The first time I went snorkeling was when I was 7. Our family went to the Caymen Islands and I went out with my dad. I still remember it vividly and also remember how panicked I was when I saw a sting ray. I figured since I was 7 and Max is now 8, it would be the perfect time. So off we went. 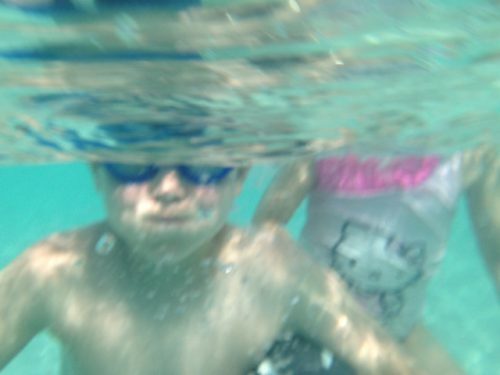 I have to say, snorkeling with young kids is not easy and didn’t work out perfectly! 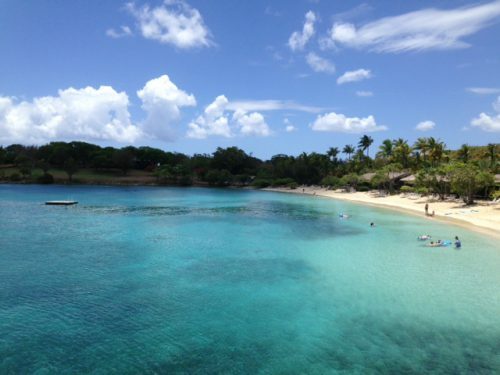 The water around Caneel Bay Resort is like bath water. Very clear and very calm. When people are snorkeling for the first time, it’s easy to feel a bit claustrophobic and panicked with your face in the water and a calm surface really helps. When we got in the water with Max, there was a bit of wind so he was worried that water would slosh over into his breathing tube and his panic was a bit over the top. He panics very easily. And was really afraid of sharks. I told him that the last time there was a shark attack on St. John was…..never. Not sure if he believed me. Both of our kids swim, but maintaining balance on their stomachs was a little difficult so a raft really helped. When they felt like they needed a big breath, they could just lift their head up and grip the raft for a little break. Full disclosure here….even as an adult, I always bring a raft–I am not a water person! When snorkeling in St. John, it’s not necessary to stray far from shore to see some pretty cool stuff. The kids got to see a sting ray, a parrotfish and a host of other colorful fish and we were only about 20 feet from the shore. It wasn’t until we got closer to the reefs that Max started to freak out. No amount of promising him that we were fine and the really good stuff is closer to the reef could convince him that we should go out further. In all honesty though, I wasn’t too sure how far from shore I should take him. I didn’t want to get stuck in a weird current with an 8 year old! Zoe was able to stick her face in the water and go out a little bit with a raft, but she still wanted to stay where she could stand up if she wanted to. Luckily there are some cool fish that stick close to shore and a sting ray came up very close to shore so she was able to share that experience with us. Pushing your kids to do more than they are comfortable with is only going to scare them off water sports of this kind, in my opinion. Max would go from perfectly fine to completely panicked in a millisecond so when he said he wanted to turn back, I did. And he says he wants to try it again when we go to Mexico so I consider this experience a success. My mom, who we were on the trip with, brought a book detailing the Caribbean fish so the kids could compare the illustrations with what they saw. We also brought a case to turn my iPhone into an underwater camera, which they thought was hilarious. 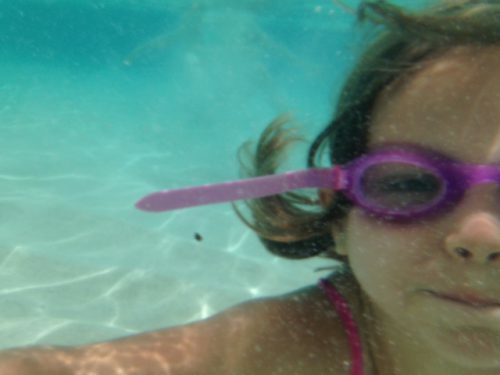 Some pretty funny underwater pictures were taken. I never thought of bringing a raft for the kids to hold onto. I know that they are generally more afraid of drowning than the rest of us. I will have to remember this for next year when we go snorkeling in the Caribbean. Then we won’t have any kids that are too scared to go swim.